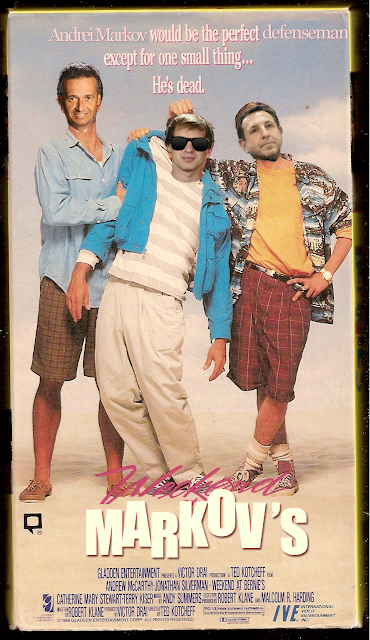 Weekend at Markov's is a 2011 French-Canadian comedy film directed by Geoff Molson. A comedy starring Pierre Gauthier and Jacques Martin features the two as a couple of old hockey guys who discover their top defenseman is deceased. Believing that they are responsible for his death and that Habs Fans won't kill them if Markov is around, they attempt to convince people that he is still alive. I laugh because if I start crying, I'll never stop. Pierre, when are we going to stop pretending that Markov can come back from this? It's been a year--he's done. Seriously, if he comes back this season, I'll eat my hat. You start cursing the ref when they call the other team for an egregious slew foot. You encourage reckless stick penalties to ensure that you can never possibly be a man up. Your players seem confused and scared at the thought of outnumbering the other team. 5 on 3 has left you with post traumatic stress disorder. Whistles send you into fits of wailing and gnashing of teeth. It's considered a successful power play when you can say "hey! They didn't score on us that time!" You consider bribing the referees to waive off penalties that the other team incurs. Other teams start to play short a man against you--without a man in the box. Header by miss macphisto. Ethereal theme. Powered by Blogger.